of accounting software in the region. 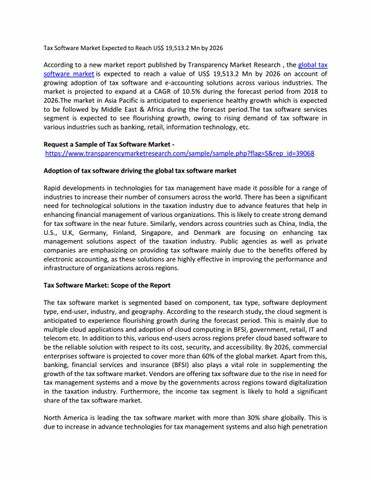 Furthermore, strong presence of tax software providers across the region is contributing to the growth of the market. North America is contributing the highest share in the tax software market because the U.S. is considered as a highly developed country in terms of technological innovations and adoptions. In terms of new opportunities, the market in Asia Pacific is expected to witness healthy growth during the forecast period. Increasing awareness of tax software as well as adoption of advance and technological solutions in the taxation industry across countries such as Singapore, India, South Korea, Taiwan, China, Malaysia, and Thailand is expected to offer prominent opportunities to the tax software market. Global Tax Software Market: Competitive Dynamics The research study includes profiles of leading companies operating in the global tax software market. 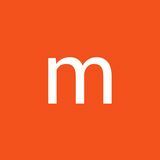 Some of the key players profiled in the market include ADP LLC., Blucora, Inc., Chetu, Inc., Intuit Inc., Drake Software. Thomson Reuters Corporation, Vertex, Inc., Wolters Kluwer N.V. (Kluwer Publishers and Wolters Samsom), Xero Limited, Sage, and Avalara.